Kampala, Uganda, 24 April 2017. A team of international researchers are, this week, 24-26 April 2017, meeting in Uganda to review progress and plan for future activities of a five-year project that seeks to improve the production and productivity of banana in Uganda and Tanzania. To support the banana improvement program in these two countries, the project brings together experts from banana breeding programs across the globe including Australia, Belgium, Brazil, Czech Republic, India, Kenya, Malaysia, South Africa, Sweden, Tanzania, Uganda, and the USA. 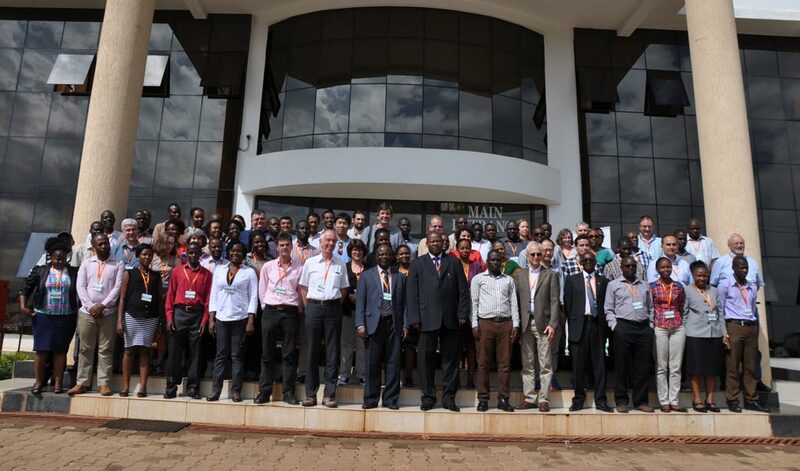 The meeting is hosted by the Ugandan National Agriculture Research Organisation (NARO) and the International Institute of Topical Agriculture (IITA). “The project aims to bolster and strengthen the banana breeding programs in Uganda and Tanzania. By the end of the five years, the team expects to develop hybrid banana varieties with a 30% higher yield and a 50% higher resistance to at least three of the major pests and diseases, compared to the current varieties grown by the farmers under the same on-farm conditions. The new varieties will also meet over 90% of the quality traits for consumers found in the current varieties”, said Prof Rony Swennen, Banana Breeder at IITA and the project’s Team Leader. The project focuses on the two most popular cooking bananas in the region―East Africa Highland banana (EAHB) also known as Matooke in Uganda and Mchare grown in Tanzania. It is addressing the two major diseases attacking the crop in the two countries―Fusarium Wilt and Black Leaf Streak diseases (Sigatoka disease), and two major pests―parasitic nematodes (microscopic worms) and weevils. “Bananas are immensely important in Uganda and the region but are being heavily attacked by pests and diseases. This project is enabling us to link with other breeding programs across the world, to exchange banana varieties, and use the best material in our breeding program. This is the first time this has happened on such a scale,” says Jerome Kubiriba, Head of the Banana Program, NARO, and team leader for the project’s breeding activities in Uganda. “Through this project, we will have a more efficient, faster, and more vibrant banana breeding system across East Africa that can better respond to our immediate and future challenges, especially now in the face of climate change,” he adds. The project’s breeding activities are being conducted at the Uganda Banana Breeding Programme of NARO, at Kawanda and Sendusu, Uganda, and at the Nelson Mandela African Institution of Science and Technology (NM-AIST) in Arusha, Tanzania, in close collaboration with regional agriculture research institutes in the banana-growing areas. “The project has got off to a flying start and is ahead of schedule in a number of activities. We are happy to report that we have so far selected 48 Matooke hybrids resulting from crosses made in this project to advance for yield assessment, well above and ahead of our year 3 target,” says Danny Coyne, IITA Soil Health Scientist and the project’s manager. This is not the first time NARO and IITA have teamed up. They successfully developed the first ever hybrids of the East African Highland Banana, named NARITA, 20 of which are being evaluated and promoted by the project in Uganda and Tanzania for local suitability and acceptance by farmers. There are 27 NARITAs, two of which were formally released by NARO in 2010 in Uganda and are now being grown in at least 15% of the banana farms in Uganda. “It took 18 years to generate these hybrids which was a major milestone in breeding banana varieties in the region. But they can still be improved on, in particular in respect to pest and disease resistance. This new project is building on this success to take banana breeding to the next level,” says Swennen. Banana are among the most difficult crops to breed due to the sterile nature of the crop, low seed set, and low germination rates of the seeds.